Which do you believe is harder for people—dealing with uncertainty, or adapting to change? Mergers confront people with both challenges. 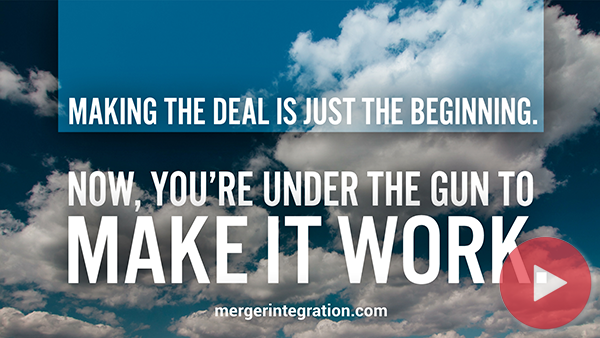 But uncertainty arrives first, and it triggers problems well before actual merger integration begins. When people realize that their company is in play, they react . . . usually in ways intended to protect themselves. As the poet John Dryden wrote, “Self-preservation is Nature’s oldest law.” Since the instinctive response to ambiguity and uncertainty is caution, you’ll see people start to pull back, feel stressed, and become distracted as they focus on looking out for their own best interests. Initiative gives way to inertia. Productivity drops. The seeds of resistance are sown and the organization begins to drift. The period between announcement and close is a hotbed of uncertainty where trouble breeds rapidly. In fact, it’s where most merger integration problems are born. So merger management needs to start right there, and it should begin immediately upon announcement of the deal. Begin with a pre-change program that counters the side-effects of uncertainty . . .